Sealed Silos, otherwise known as gas tight silos are recommended for long term storage of grain. Sealed silos are a controlled atmosphere that acts as fumigation chambers for effective control of insects at all life stages. Aeration assists grain quality and fumigation in a silo through preventing: insect development, mould and reducing grain moisture. When grain goes into a silo, it isn’t always below the recommended moisture level, aeration ensures your grain is kept cool during storage. 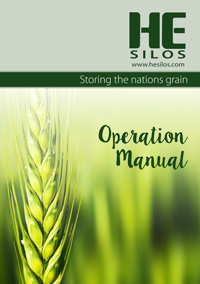 HE Silos Aeration works through using the fan to force air into the ducting, this in turn distributes the air throughout the grain in the silo, maintaining a low temperature. Upon ordering a silo with aeration, we send you out a specific design plan to ensure your aeration is positioned on the silo where you need it. Please let our friend staff know if you require three phase aeration, our standard aeration is single phase. 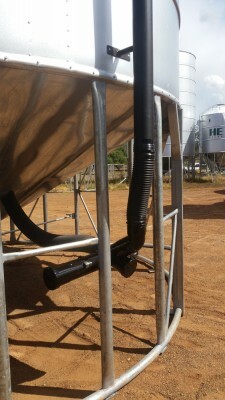 HE Silos offers fan forced (recirculation) fumigation systems or a more affordable thermal fumigation alternative. With the increasing resistance of Weevils to phosphine treatment in unsealed silos, the importance of pest control for farmers who on-sell their grain is paramount to their success in the modern market. Because of this fact alone, HE Silos has de-signed a product that will ensure your grain remains insect free. Fan Forced Fumigation works by circulating air inside the silo for more even dose of phosphine gas. Recirculation of phosphine gas within the silo controls pests at all life stages. Fan forced fumigation is an added bonus with the aeration system already fitted. Thermal fumigation works on the principle of heat – hot air rises. Sunlight heats the black polyurethane pipe (or black steel pipe on request) causing the phosphine gas to rise. Because phosphine gas is heavier than oxygen, the gas then falls through the grain and the cycle continues. Thermal Fumigation is a solution for clients who don’t have power on site. Phosboxes and Phostubes reduce the need to climb silos as they provide safer handling of phosphine tablets at ground level. 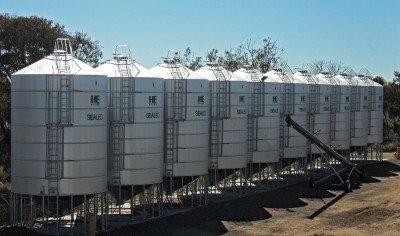 HE Silos uses, silo waterproofing & sealing phosboxes and phostubes. Please contact our friendly staff for more information of sealed silos, aeration and fumigation systems.